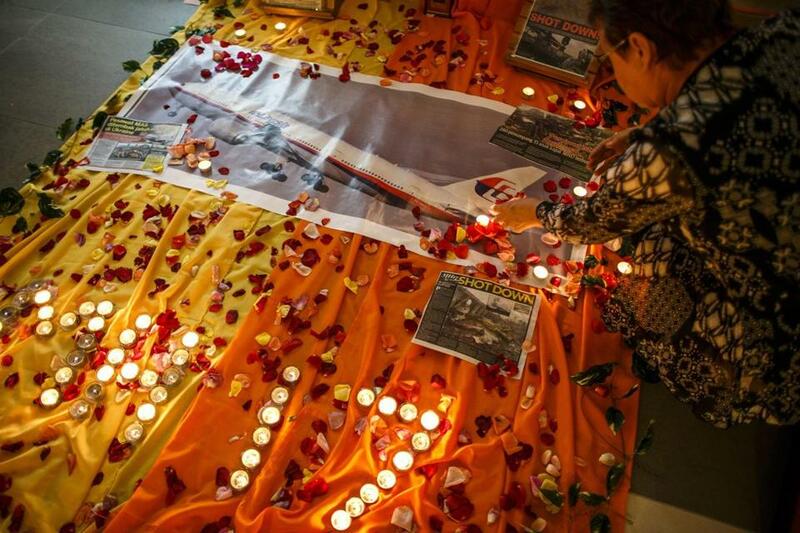 In Kuala Lumpur, a woman lit candles at a memorial for victims of the downed Malaysia Airlines jet. KUALA LUMPUR, Malaysia — Still raw from the loss of one airliner just over four months ago, Malaysians on Friday confronted the improbable loss of another passenger jet, this time the victim of a conflict far from home. Like last time, there is anger, in this case over whether Malaysia Airlines was cavalier in continuing to fly over a war zone in Ukraine when some other airlines had begun to reroute their planes. But the grief over the latest tragedy is different from that of the first. Part of the continuing horror of Malaysia Airlines Flight 370 is that the cause of its demise, and its resting place, are still such a mystery, leaving stricken families no bodies to bury. Although the perpetrators of the downing this week of Malaysia Airlines Flight 17 remain unknown, the gruesome evidence of their actions has been broadcast and shared on social media worldwide. Bodies, many intact, have been shown amid the wreckage, some in fields of flowers. At least 44 of the dead are Malaysians. Suspicion has fallen on pro-Russian rebels — a suspicion further fueled by U.S. reports Friday that the missile that downed the jet came from rebel territory. But there is no proof yet of who did the firing. The plane was flying from Amsterdam to Kuala Lumpur, the Malaysian capital, carrying 298 passengers and crew. Public grief has not yet reached the same intensity as after the March disaster, when investigators say Flight 370 veered wildly off course and, they believe, plunged into the Indian Ocean, killing all 239 aboard. In that case, Malaysians were scandalized that their government so badly managed the tragedy, all under an international spotlight. First, the military overlooked radar clues that the plane had gone off course. Then the government waited days to disclose the evidence of the plane’s change in direction while an international search effort continued to focus on the wrong seas. Fifty Malaysians were lost with that plane. On Friday night, many residents of Kuala Lumpur shopped and ate as usual, with many Muslims taking a nighttime respite from the demands of daytime fasting during Ramadan. But about 150 students and residents gathered outside one shopping mall for a scheduled commemoration of Nelson Mandela that also turned into an impromptu mourning vigil for Flight 17. The anger over the airline’s decision to fly the Ukrainian route, if it grows, could prove a new challenge for the government. The Malaysian government and Malaysia Airlines have both said the route was heavily used by other carriers, and was deemed safe enough until the calamity. The government could come under renewed pressure if it fails to persuade people that the decision was sound, said James Chin, a professor of political science at the Kuala Lumpur arm of Monash University, an Australian university. Others focused their anger on Russia, which the United States and others have accused of providing increasingly sophisticated weaponry to the rebels. One question is whether any such cache included the missile that destroyed the plane. Some residents and experts said their own government appeared to have heeded some lessons from the Flight 370 disaster. In March, Prime Minister Najib Razak gave his first televised statement on Flight 370 more than a week after it disappeared. This time Najib, who lost a distant relative on Flight 17, according to the Malaysian news service, appeared within hours of reports that the plane had been shot down. What could be learned from black boxes in downed Malaysian plane? Why were commercial airlines still traveling over eastern Ukraine? Dutch-US citizen aboard plane had lived in N.J.
What would it take to shoot down jet?